I love salade lyonnaise. It’s an exercise in simplicity. 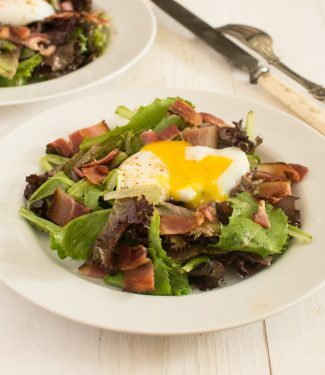 Nothing more than some greens tossed in a bit of French vinaigrette, a poached egg and some bacon. Doesn’t sound like much. But when the yolk, bacon and greens come together in your mouth… Special. This salad hails from Lyon, France. Arguably the food capital of France, Lyon has contributed many classics to French cuisine. Traditionally, it’s made with frisée or baby chickory. Frisée is not always easy to find, so I’ve done it here with baby greens. Not quite the same but still very good. If you can get your hands on frisée, use it. Salade Lyonnaise is supposed to be served with lardons. Lardons are much lighter tasting than North American bacon. Blanching the bacon quickly in a bit of water cuts the smoke and is a pretty good approximation of lardons. I’ve covered off a couple ways to poach eggs, conventional and sous vide. Either way, salade Lyonnaise is a great salad. 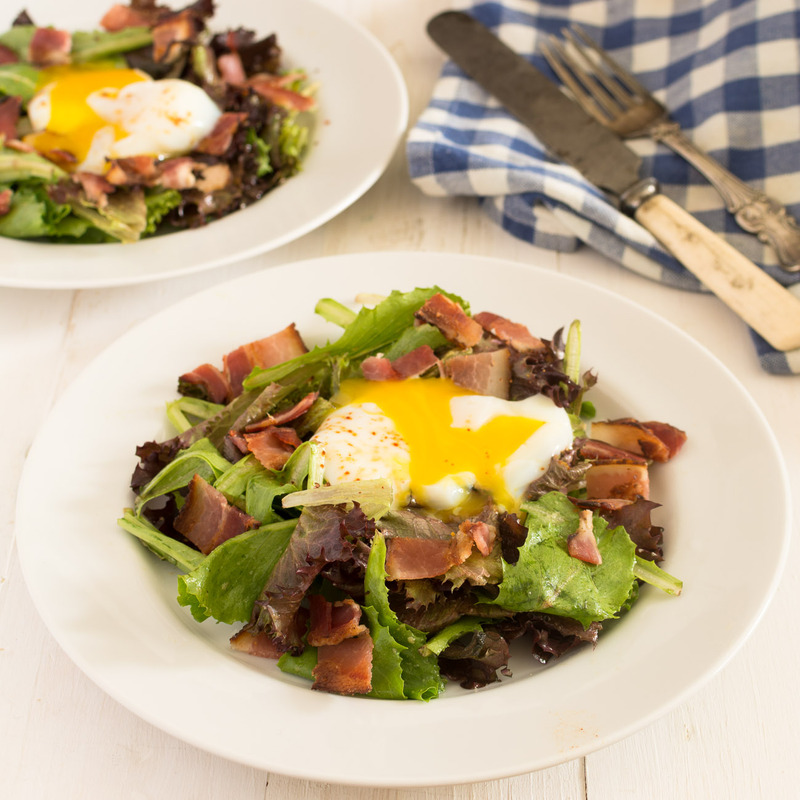 Salade lyonnaise - a simple green salad with bacon and a poached egg - makes an elegant appetizer or a nice light lunch. Bring a saucepan of water to a simmer. Blanch the bacon for about 30 seconds by placing the bacon in the hot water. Drain. Pan fry the bacon until cooked but not overly crisp. Bring a pot of salted water to a boil. Add a tablespoon of white vinegar. Reduce heat to bring the water down until barely simmering. Break the eggs into individual small bowls. Carefully but quickly submerge the egg in the water and remove the bowl. Cook for three minutes. Remove the eggs with a slotted spoon and season with salt. Use your eyes. Barely simmering is subjective. If the egg doesn't look cooked it probably isn't. Bring your sous vide to 145F. Cook the eggs in their shells at 145F for 45 minutes. Bring a saucepan to a boil and then reduce the heat to bring the water to a gentle simmer. Crack the egg against your counter. Peel off enough shell to be able to pour the eggs into individual small bowls (one per egg). Carefully but quickly submerge the egg and bowl in the simmering water. Remove the bowl. Poach for about 1 minute. You just want the white to set up a bit more. You don't want to continue to cook the yolk. Remove the egg from the water with a slotted spoon and season with salt. Salt the greens and toss the greens in the vinaigrette and distribute onto 4 plates. Sprinkle bacon over the greens. Top with a poached egg and a bit of fresh ground pepper. In appetizer, french, salad. Bookmark the permalink. Very good, congratulations on the site.